That's right—no palm oil, no castor oil—just those three oils, and it's really very good soap. It doesn't have quite the heavy, creamy lather that adding castor oil gives. It's a lighter lather, but quite plentiful—perfectly respectable soap. It's a great recipe to get started with soap making because these oils should be readily available and make a good option for a grocery store soap. The Crisco, and the absence of castor oil, also make this a great recipe to learn how to swirl with—because it will be slow to come to trace. The formula for Crisco has changed since the early 2000s. It now incorporates a fair amount of hydrogenated palm oil, which is good for making soap. If you're using Crisco, be sure to know what kind you are using and and adjust your lye calculator accordingly. Most lye calculators have a setting for "old Crisco" and "new Crisco." If your label lists "hydrogenated palm oil" as one of the ingredients, use the "new Crisco" setting. The recipe below is formulated using "new Crisco." While Sandy makes huge batches of soap, this recipe will just make a 2-pound batch, so it's a good size recipe to get started making soap with. If you want to substitute oils or scale it up, just be sure to run the recipe through a lye calculator before you start. Assemble all of your equipment and ingredients. Pre-measure your fragrance or essential oil. Mix your lye solution and set it aside to cool. Measure and heat your solid oils until completely melted. When both the lye and the oils are at about 100 to 110 F, slowly pour the lye solution into the oils. Stir with a stick blender, alternating short blasts with the blender and stirring. Mix the soap until it reaches a light trace. Add the fragrance oil and/or any colorants you are adding. Mix it into the soap thoroughly, just using a whisk. Don't stick blend after you've added the fragrance oil. Pour the raw soap into your mold and let it sit for 24 to 36 hours until it has cooled off completely and is hard enough to cut. Because this recipe doesn't have any palm oil, if you're using "old Crisco" or stearic acid plentiful oils like tallow, it may take an extra 12 hours or so to harden up. Just be patient; it will get hard enough to cut. Remove it from the mold and slice into bars. Let it cure an additional two to four weeks. 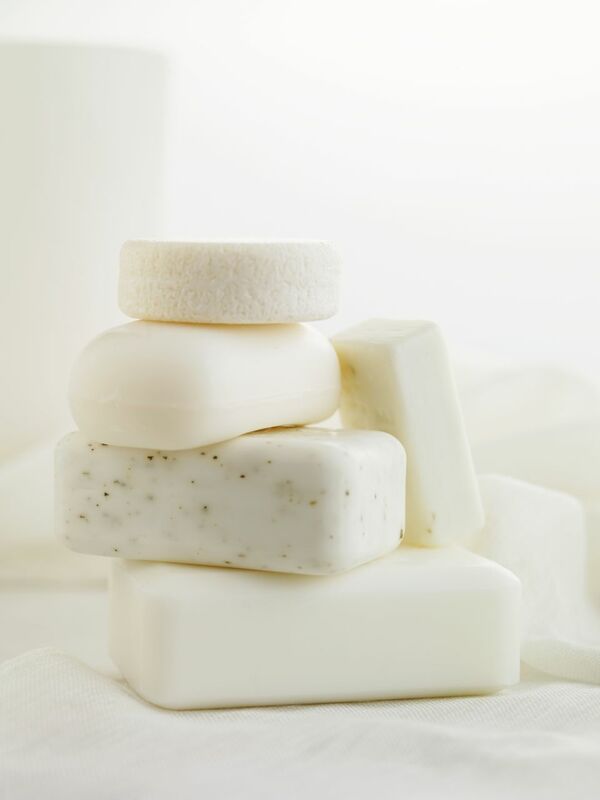 For more detailed directions on making soap check out step-by-step cold process soap making.